The Miami Marlins have announced the demotion of starting pitcher Kevin Slowey to the bullpen in the wake of poor outings and as means to make room for Nate Eovaldi, who will attempt to return to the starting rotation for the first time this season. After starting the first seven games of the season on a strong note, in which he posted a 1.81 ERA and 36/8 strikeout to walk ratio in 44 2/3 innings of work, Slowey has regressed tremendously in his last seven outings. Over the course of those seven starts, Slowey has posted a 1-4 record and 7.08 ERA in 32 1/3 innings. In his most recent start on June 12, Slowey surrendered six runs over five innings en route to his sixth loss of the season. 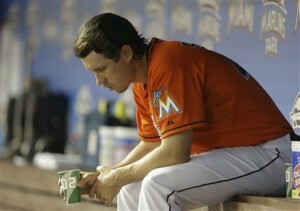 In the meantime, Slowey will fit into the long reliever role for the Marlins and will attempt to resolve recent woes on the mound. Although Slowey has seen his ERA rise over his past seven starts, his command and control have not been of major concern, as he has posted a solid 28/6 strikeout to walk ratio in that span. Replacing Slowey with a pitcher who has been injured all season (and when healthy, has put up mediocre numbers at best) may not be seen as the best move, but it can be assumed that Redmond is testing the waters in an attempt to bring in a spark for a team that has underachieved for the majority of the season.